As we begin these last few months of the school year, I want to thank you for your participation at our recent parent-teacher conferences. My hope is that this was an opportunity for you to celebrate your child's progress and learn more about their next steps in growing as learners. Please know that your partnership, feedback and support is valued and greatly appreciated by our staff. "What's the coolest thing that happened today? What wasn't so cool?" "Pretend your the teacher. How would you describe the day?" "How were you kind or helpful today? How was someone kind or helpful to you?" "Tell me what you learned today that you'd like to know more about." If you find that you aren't getting many details from your child hopefully these conversation starters are a help! 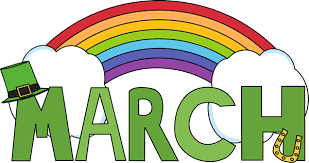 This upcoming month is a big testing month for our students in grades 3 and 4 with the MEA assessment, and we also look forward to having some wonderful learning experiences for our students beginning with a special event to ring in the first day of March! Have fun ... and of course, take time in your own lives to READ! The YHS Interact Club will be hosting a "Pond Party" at the pond at Key Bank this Saturday, March 2, from 10am to 4pm. We will be selling baked goods and coffee. Marshmallows will be available for roasting. All profits will go to the Muscular Dystrophy Association. Come by to skate and have a blast! Contact karin_walsh@yarmouthschools.org or y2019abivan@yarmouthschools.org for questions or more information. The YHS Interact Club will be hosting a Kid's Night Out on March 8 at 6pm at the First Baptist Church in Yarmouth. We will be selling baked goods, popcorn, pizza and water. Admission is $12 per child and $10 for each additional sibling. All profits go to the Yarmouth Food Pantry. Bring books to donate to Lunch Crunch (3 books equals 1 free popcorn). Bring sleeping bags, blankets or pillows to lounge! Contact karin_walsh@yarmouthschools.org for questions or more information. We look forward to the time when our days start getting longer. Don't forget to set the clocks one hour ahead when you go to bed that night! To celebrate St. Patrick's Day (Sunday, March 17th) students may choose to wear green articles of clothing, including hats, to school on this day. The Yarmouth Parent/School Alliance is an opportunity for parents and schools to communicate with each other, learn together and support one another. At our last meeting in February, participants heard from Jonathan R. Werner on the rise and impact of addictive technology. Technology, like computers and smartphones, gives us incredible access to information and one another. However, it can also easily take over our attention and have a negative impact on our wellbeing. Young people are even more susceptible to their draw because of their developmental stage combined with growing up in a world where they are ever present. At the end of this interactive workshop, participants will leave with an understanding of how to manage their technology use within their families. We hope that you will be able to join us! This meeting will be held from 6:30 p.m. to 8:00 p.m. in the Yarmouth High School cafeteria. Please pre-register for the event by filling out this form. Our monthly PTO meeting will be held in the YES library at 7 p.m. All are welcome! Please consider attending to hear about all the great work the PTO is doing and learn how you can get involved to support their efforts. To kick off the Wave, all K-8 families are invited to a family activity night this Friday, March 1, 5:30-7:30pm in the HMS cafeteria. We’ll have Acts of Kindness stations, including making dog and cat toys for shelter animals, placemat decorating for Meals on Wheels recipients, kindness rock paintings to give…and more! We will also have food for purchase; all proceeds will go to the YCAN Lunch Crunch program. If you would like to contribute to the Kindness Café, click here: http://signup.com/go/oowrind. If you would like to help us set up for the event or help at a kindness station, please click here. http://signup.com/go/uQTvorq. We’d love to work with both teens and adults, including YHS students! Not able to make it this Friday? We have a second, similar event scheduled on March 9, 11am-2pm at Yarmouth History Center. This event is for all ages. For HMS students, we are holding a game night at Bay Square assisted living facility on the evening of March 11, time TBD. Please feel free to reach out to Ashley Smith for questions (ashley@signsmith.com), or visit the website:www.waveofkindness.com. We are excited to see the goal of 10,000 acts of Kindness rise over this period! Hannaford Gift Cards – Due Wed, March 6 and March 27, noon. Please look for forms later this month or print and fill out the form here. Silver Graphics – Our popular annual Silver Graphics sale will be starting soon! You can order beautiful and fun keepsakes featuring your student’s artwork. The sale runs March 28-April 10. Delivery the week of May 6, before Mother’s Day. More info coming soon. PTO Meeting – Please join us March 21 at 7pm in the YES library. This K - 12 student competition is sponsored by the Music Boosters and the proceeds benefit our music programming. All talent is welcome to audition - music, dance, arts, magic, comedy...or any creative endeavor that will win over the audience! Auditions for grades K-4 will be held here at YES at 3:45 p.m. Cash prizes are based on audience vote. One first prize for each age group. Official rules and entry forms at YarmouthsGotTalent.org. Get your tickets! We look forward to seeing some of the amazing talent from YES in action that night! All of our third and fourth grade students will be taking the reading, math and essay assessments over the course of six mornings in March and April. We have scheduled our students to take these assessments on 3/26, 3/27, 3/28, 4/2, 4/3 and 4/4. We appreciate your help in making sure that your children are here in school on these days and well rested to take these important assessements. Big Problem or Small Problem? Students have been learning the difference between the two. Big problems occur when there is danger and the student feels unsafe. These problems require adult help. Examples of big problems are someone is being pushed in the hallway, someone is stealing from the teacher’s desk or a classmate is hurt on the playground. Small problems can be losing a game or not getting something you want. You can practice at home by helping your child problem-solve. First, ask your child “Is it a big or small problem?” Once your child says it is a small problem ask them what are some things you can do to solve this problem and discuss the possible solutions such as waiting, sharing, taking turns, taking a deep breath, or doing something else. It is important to develop good problem-solving skills as they increase academic success, encourage teamwork, enhance creativity, and strengthen communication skills. We have seen a significant increase in planned family absences this year. We certainly appreciate and respect the importance of family time and recognize that there are special opportunities and events that do occur. However, the state of Maine defines chronic absenteeism (excused or unexcused) as missing 10% or more of the school year. In a 175 day school year chronic absenteeism would be considered about 17 school days. The research supports that students missing such a significant amount of time in school has an impact on their learning. Teachers cannot replicate the rich learning experiences that students miss when they are out for such an extended period of time. Additionally, it is not always doable or reasonable for teachers to provide work ahead of time for such long absences. Respectfully, we ask that everyone please give careful consideration to your family plans and make every effort to prioritize student attendance. We appreciate your support with this. Last year began our annual "YES Spirit Week" and it was a huge success. This year will once again feature fun spirit week dress up days like "Inside-Out Day", "Yarmouth Clippers Day", "Mismatch/Mix and Match Day" and "Hat Day". Let's have some fun celebrating the arrival of spring! On this evening Mr. Borda, a math teacher at YHS, and his student advisees are planning to host a fun activity night for second and third graders at YES as part of their service work. There will be more details to come on the event, including pre-registration information. Our Grandparents/Special Family Friends Day is held every year on the Friday of Memorial Day weekend. More details will come as we approach the date but please note this day for your planning and communication to all those grandparents and family friends who will be attending! As always, please do not hesitate to contact me with any questions, concerns or feedback you would like to share. Thanks for all that you do!